People from Mississippi are fat. With an adult obesity rate of 33%, Mississippi has gobbled its way to the "chubbiest state" crown for the fifth year in a row, according to a new joint report by Trust for America's Health and the Robert Wood Johnson Foundation. 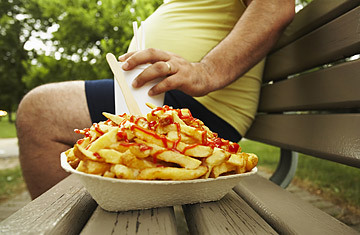 Alabama, West Virginia and Tennessee aren't far behind, with obesity rates over 30%. In fact, eight of the 10 fattest states are in the South. The region famous for its biscuits, barbecue and pecan pies has been struggling with its weight for years  but then again, so has the rest of the country. Wisconsin loves cheese, New Yorkers scarf pizza, and New Englanders have been known to enjoy a crab cake or two. So why is the South so portly? For one thing, it's poor. Mississippi is not only the fattest state in the nation, but also the poorest, with 21% of its residents living below the poverty line, according to the U.S. Census Bureau. Alabama and West Virginia, the second and third fattest states, are tied for fifth poorest. With a poverty rate of 14%, the South is easily the most impoverished region in the country. "When you're poor, you tend to eat more calorie-dense foods because they're cheaper than fruits and vegetables," explains Jeff Levi, executive director of Trust for America. Poor neighborhoods also have fewer grocery stores, even in the rural South. A 2004 study by the University of South Carolina found that most food-shopping options in rural areas fall into the convenience-store category because grocery stores are located too far away. But although poverty puts people at risk for obesity, it doesn't determine their fate. A number of impoverished states  including Montana, Texas and New Mexico  have relatively low levels of obesity. There must be something else. Maybe it's the culture. Southerners definitely enjoy their fried chicken (not to mention fried steak, fried onions, fried green tomatoes, fried pickles and fried corn bread). Even when their food isn't fried, they like to smother it in gravy. But while nutritionists frequently blame Southerners' large guts on their regional food choices, the accusation is a little unfair. Just as Californians don't actually live on wheat grass and tofu, Southerners don't really sit around eating fried chicken every day. "I've not come across anything that says the diet in the Southeast is worse than the rest of the country," says David Bassett, co-director of the University of Tennessee's Obesity Research Center. "We're definitely in what I like to call the 'Stroke Belt,' " he says, referring to Southeastern states' high percentage of heart disease and hypertension, "but I think that has more to do with Southerners' lack of physical activity rather than the food." Bassett isn't just talking about neglected gym memberships and people who sit on the couch all day. Physical activity can be something as simple as walking to the bus stop. That's another problem, by the way: the South doesn't have many bus stops. Public transportation is paltry, and for most people, the best way to get around is by car. "You don't really think of riding the train as exercise, but at least you have to walk a few blocks to get to the stop," says Bassett. States like Mississippi and Tennessee also have a surprising lack of sidewalks, discouraging even the most eager pedestrians. Many roads are narrower than those in the North  where streets have wider shoulders to accommodate winter snow  and people who want to bike or jog find themselves uncomfortably close to traffic. But who wants to exercise when it's 100 degrees outside? The South is really hot and humid. Nobody in Mississippi goes running in the summer  at least, nobody sane. Bassett points out that Colorado, the state with the lowest obesity rate (18.9%), is relatively affluent and has a temperate climate and plenty of trails that lend themselves to outdoor activities. So there you have it. Southerners have little access to healthy food and limited means with which to purchase it. It's hard for them to exercise outdoors, and even when they do have the opportunity, it's so hot, they don't want to. To combat this affliction, some Southern states have adopted programs to fight rising obesity. In 2003, Arkansas passed a school body mass indexscreening program that assesses weight and sends the results home to parents. Tennessee encourages its schools to buy fresh ingredients from local growers. And in 2007, Mississippi adopted nutritional standards for school lunches. Most of these programs are relatively new, so it will be a few years before experts can determine their efficacy. "I think there's reason for optimism," says Barrett. "But it's likely that the Southeast will lag behind the rest of the country for some time to come." Watch TIME's video "How to Lose Hundreds of Pounds."